Our district has achieved Apple Distinguish Program status (2012 - 2017). One of the categories for Apple Distinguish Program is flexible learning environments. As our one-to-one program has changed and grown, so have our flexible learning spaces. We knew that when we went 1:1 we would have to change our learning spaces (and lots of other things too). We got rid of desks and brought in tables. 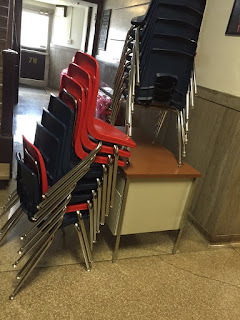 Many teachers got rid of their teacher’s desks too. Some even brought in alternative chairs like exercise balls, or stools. Many teachers also began to send students to hallways and landings for recording. These recordings were for students to demonstrate their thinking and understanding of the concepts that were being taught. Each school bought at least one green screen kit. Teachers also began buying them on their own or making them out of the materials that they had available. They're actually quite easy to make on your own. I've seen green screens made for as little as $10. We’ve even used Double Robot (as seen on Modern Family and Big Bang Theory) to help home bound students. The home bound student is able to drive the robot around their classroom. They are able to participate in small group, whole group and individual activities as if they were there. Our Superintendent Dr. Stan Fields has been talking about having our libraries look more like Starbucks for about three years now. He has been an advocate for alternate learning spaces. It's great when you have supportive administrators. We have admins who understand, you can't just keep doing the same things, and expect to get different results. In November I observed +Virginia Burdett's classroom. As I observed in her room I realized that she is doing amazing things in her instruction, but that her students were hardly ever in their seats, at their tables, or even in the classroom. Which is not necessarily a bad thing. With the way that Ginny teaches and the way her students learn they don't need to be in their seats all the time. They needed an even more flexible learning space. I met with Ginny and she agreed. We began planning and negotiating what the room might look like. We started with a Google Doc. We made different categories, like what to keep, what to get rid of, what to buy, what to make, and what to get donated. We scoured the web for pictures of flexible learning spaces, and made notes about what we liked, and didn't like about the spaces. We kicked that around for about two weeks. We thought it was important to keep some traditional seating in the classroom. We also agreed there should be some alternative seating. The biggest thing we agreed on was that 4-BU had way too much furniture for the number of students and square footage of the room. She had to 2 - 6 foot tables and 4 - 5 foot tables for 23 students (see pics above). One of the things that we had to make sure we remembered was that in the end there would be enough seating or a space for every child in the room, plus a few extra. We got some of our inspiration from this article by Kayla Delzer, Why the 21st Century Classroom May Remind You of Starbucks. Thanks Kayla for including pics and FAQs! Over winter break we worked to empty out the classroom and get it organized. There were 24 student chairs in the room we got rid of 16 and kept eight. The eight chairs are now at the two traditional tables. There are four chairs at each table. We kept three of the 5 foot tables. We got rid of both of the 6 foot tables and one of the 5 foot tables. Eventually we hope to get rid of one more 5 foot table and add more alternative seating. We also brought in 1 circle table. We got rid of the teacher’s desk. Ginny was only using the teacher's desk for some storage and a place to put her teacher laptop while using the Apple TV, so she knew she wouldn’t miss it. In the front of the room where the teacher's desk was we replaced that with the circle table. I painted the circle table and two of the 5 foot tables with whiteboard paint. It is a very inexpensive alternative to purchasing regular white board tables. It cost about $50 to paint the three tables. I got the idea from this blog post and read more about the process on the Rustoleum website. Our fabulous custodian took part of the legs off of two of the 5 foot tables, so that they are about 18 inches off the ground. Ginny bought 10 pillows from Target. They were $10 each. She brought in an old futon and a small side table that she had at home. I found a floor lamp for free on a swap site on Facebook. She had two bungee chairs in her room already, and some small circle size carpets. She also had a black cube, that is an ottoman and also opens up for storage. We got rid of the students' seat pockets that were on the backs of the chairs. Ginny bought 3 -10 drawer carts from Sam's Club for students to store their belongings. They have a few folders, their iPads, a pencil case and headphones. We are still in need of curtains, three large carpets (for under the tables), clipboards, and a new seating arrangement that I don't want to say too much about. We want it to be a surprise. The curtains are being made and we will write a Donor's Choose proposal for the rest. 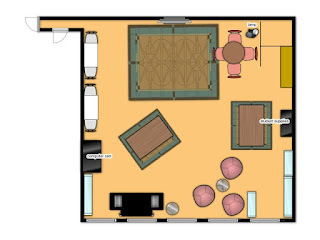 Floorplanner.com 2D & 3D image for planning. In the end I would say that we have three different types of seating. We have two traditional tables one circle, and one rectangle. They hold four children each or 8 children total. The circle table is a whiteboard table. We have two semi-traditional seating spaces. These are the 5 foot rectangle white board tables which are 18 inches from the floor. The students sit on pillows at these tables. There are five pillows at each table, for a total of 10 students. At this time we have two non-traditional seating arrangements. One of these spaces is the futon. The maximum capacity at the futon is three students. We also have the bungee chairs and cube. Up to three students may sit in this area, for a total of six more spots. This makes a total of 24 spots. We made signs for each seating area. The signs named the area and gave the maximum seating capacity. They will stay at the tables, as a reminder, till they get lost or torn up. Collaborative Learning Spaces: Classrooms That Connect to the World written by my friends Jennifer Williams and Fran Siracusa suggests that students should be involved in the process. We didn't do this. Instead we chose to surprise Ginny’s students when they returned from winter break. Boy were they surprised! Ginny used this chart to work with them and introduce the new learning space. She did a fabulous job of setting the tone. Students spent the next three days rotating through the three different learning spaces (thanks Kayla). They had to stay in the same seat the entire day. Each day they were asked to reflect about their experience in a Schoology discussion. At the end of the three day trial students were allowed to sit anywhere. This is a very good group of students and they have been very respectful and responsible about their choices of where to sit. Ginny has done a good job of teaching them respect and responsibility this year. The thoughtful way in which she rolled out the new seating also helped. On the first day of open seating I had one boy who was sitting on the futon all by himself. He put the futon down into a bed. After a transition two girls joined him on the futon while it was still in the bed position. All three lay there and read their books. As I walked over he began to stand up, he told me that he now wanted it back in the couch position, but the girls did not want to have it that way. I politely told him that he had two choices he could continue using the futon in the bed position, or he could choose somewhere else to sit. I talked to another student for a minute or two and when I looked around I saw that he had chosen a new place to sit. This all happened without incident. If you give the students choice and responsibility they will rise to the occasion. They appreciate you treating them like adults. When the administrators in the building came to see what we had done and how the students had reacted, they both said to me that they would love it if other teachers would do the same. I said to them that this does not fit every teacher's style. This was a fun experience. It is still a work in progress. We have blasted out on Twitter pictures of what we have done. 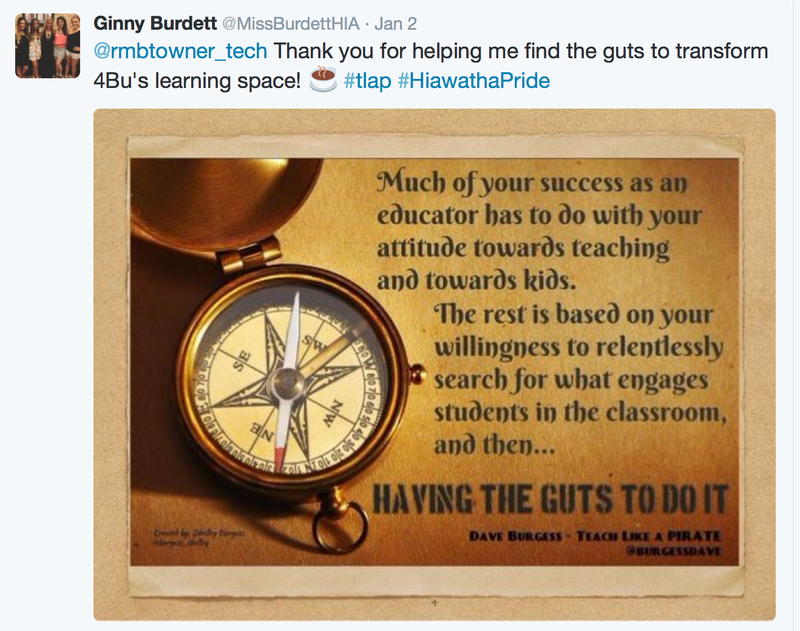 Watch for more on Twitter from @rmbtowner_tech and @MissBurdettHIA as we continue to add things and make changes. I had another teacher in our district approach me already. She would like me to help her with her room redesign next school year. Her big request is a space for green screen recording. That is going to be a challenge that I can't wait take on. Thank you to Ginny for giving me an opportunity to do a project that expanded my horizons and pushed my limits. I have to give Ginny a lot of props for changing her room and her routine during the middle of the school year. This is not easy for any teacher, but Ginny embraced it and made it hers. She certainly has courage and determination! She did it because she knew it was what is best for her students! One additional note, there were no 4-BU students working in the hall or in the Principal's office this week. Problem solved! Stay tuned. I will write about the finishing touches for this project and give final out of pocket cost.